Nissan Juke Nismo prices revealed | What Car? The Nissan Juke Nismo high-performance SUV will cost from 19,995 when it goes on sale in January. Nismo is Nissan's performance division in Japan, and the Juke Nismo is the first Nismo-badged road car designed for the European market. The Juke Nismo is powered by a 197bhp 1.6-litre turbocharged petrol engine, and will be available with either front- or four-wheel drive. Manual front-wheel-drive cars manage the 0-62mph sprint in 7.8 seconds, while four-wheel-drive versions, which get an automatic CVT gearbox as standard, do it in 8.2. To allow the Juke Nismo to make the most of its extra power it also gets stiffer suspension designed to improve traction and make it more responsive through corners. Exterior changes for the Juke Nismo include lower front and rear bumpers, wider wings and sideskirts, a modified grille, tailgate spoiler and Nismo badging. There are also 18-inch alloy wheels, red door mirrors and a matching red stripe. Interior upgrades include suede-trimmed Nismo sports seats with red stitching and deep side bolsters. There's also a mixture of Alcantara and leather on the steering wheel, and suede on the door trims. Other changes include a black centre console, black surrounds for the door switches and black headlining. 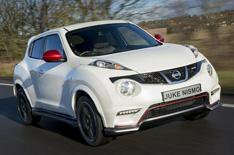 The Juke Nismo will be built in Sunderland alongside other Juke models. It'll be available to order in January, with first deliveries in March.